Take the time and effort out of cooking tonight with our Quick Chicken-Spinach Skillet. 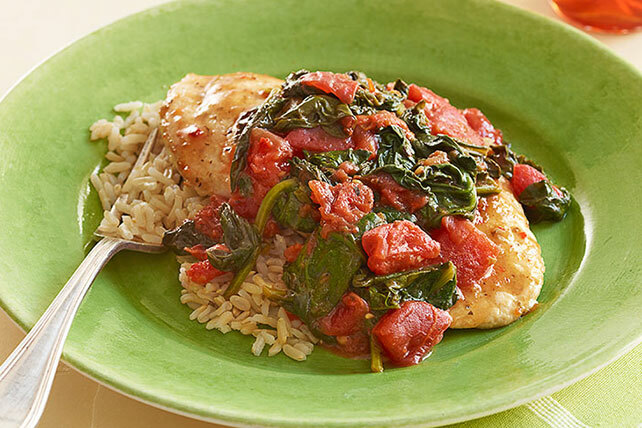 Served on a bed of hot brown rice, our Quick Chicken-Spinach Skillet is full of delicious flavor and takes less than an hour to throw together. Heat oil in large nonstick skillet on medium-high heat. Add chicken; cook 2 to 3 min. on each side or until done (165°F), drizzling with remaining dressing for the last minute. Transfer to platter; cover to keep warm.